So clean, crisp, and peaceful! I’d love to be sitting there watching that water trickle on over those rocks! You know what’s funny? This is in the middle of the LL Bean flagship store! A bit chaotic, but still fun to sit by. I really love the color of the rocks. So striking! Sitting and looking at a pond (or any water for that matter) can be quite peaceful! Are you near the LL Bean store then? Michelle @ A Dish of Daily Life recently posted..Sideline Parents, Take it Easy on our Youth Referees! We’re in the middle of it! My boys always love to visit the trout pond in the store. It’s always our meeting place if we get separated since it’s right in the middle of the first floor. They also have a big fish tank there. I would love to be looking at that in real life… it looks so serene! Water is always serene…even in the middle of a store! I agree, Angie. There are some bigger rocks you can sit on by the pond. When I was a kid my neighbors next door had a pond with all sorts of fish and totally brought me back today with this picture. This one’s in LL Bean. It’s fun to see them do fishing demonstrations. The trout were hiding under rocks while we were there. It’s a great place, isn’t it? I love looking at rocks underneath the water. 🙂 Great picture! And one question….you don’t like ANY pie? Nope. I hate pie. Well, unless chicken pot pie counts? Looks so gorgeous and refreshing. We are making at least two trips to Maine/NH this summer – I’ll let you know the specifics. And there’s always Six Flags and our meetup in August. Tamara recently posted..How You Know Your Youngest Is Nearing Two. I can almost hear the water trickling past that big rock. Peaceful. It is pretty peaceful, even in the middle of a big store. It’s a nice place to visit to escape the chaos. Thanks, Amber. 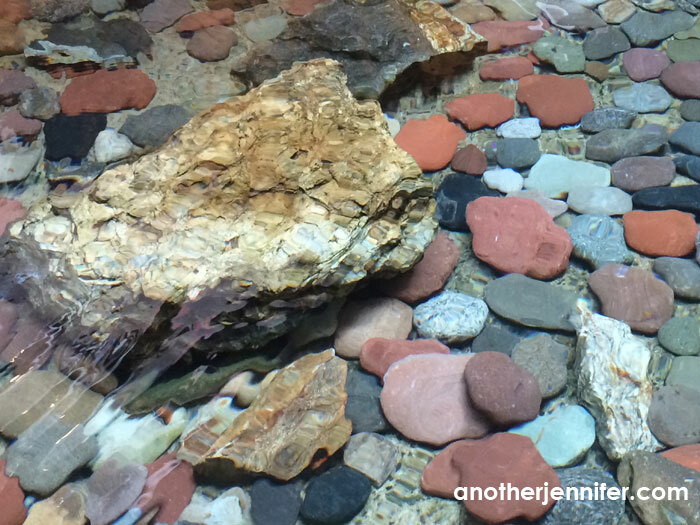 I liked the colors of the rocks under the water.